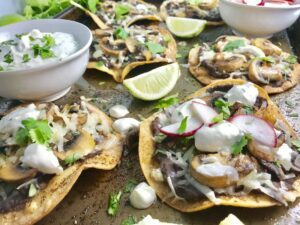 Mushroom and Black Bean Tostadas with Manchego Cheese and Cilantro Lime Cream are crazy good! 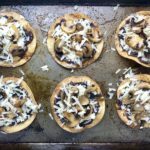 The tortillas are baked until perfectly crunchy, then topped with homemade refried black beans, nutty Manchego Cheese, sautéed mushrooms, more cheese, and then baked until the cheese is melted. Top it with cool cilantro lime cream, crisp radishes, and fresh cilantro. Again, CRAZY GOOD! 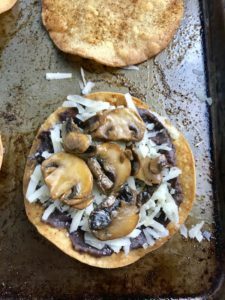 I made these Mushroom and Black Bean Tostadas while my Dad was visiting this past weekend and we could barely wait until they were on the table before attacking them. I also may or may not have had one the next morning for breakfast🙄. Tostadas are great because you can top them with just about anything you want. 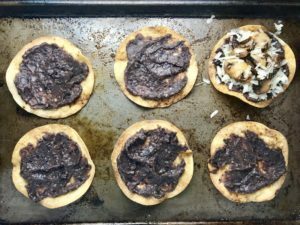 Traditionally, they are topped with refried pinto beans and cheese, so I wanted to stick somewhat close to that, but venture out a bit. Refried beans are quite literally beans that are fried two times. They are first cooked and then mashed and cooked again. My version takes a couple short cuts to save on time. 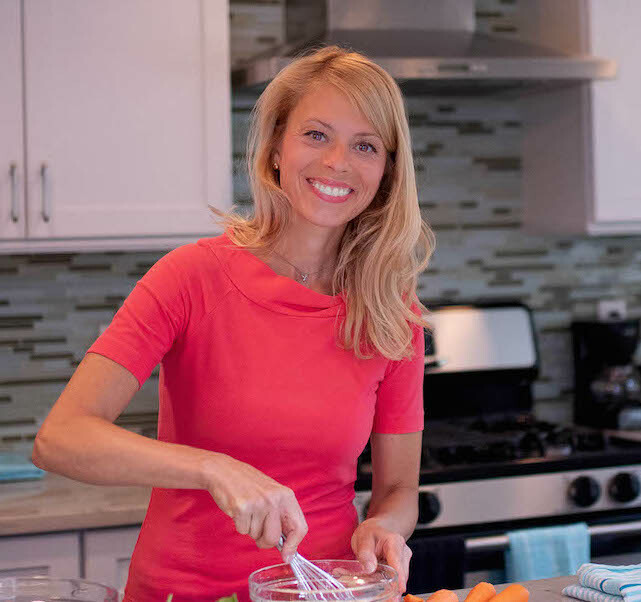 I suggest buying canned cooked beans and then putting all of the ingredients into a food processor and blending them up with the beans before cooking them in a skillet. 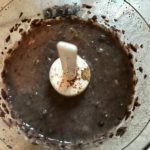 (Check out my SHOP Page for the mini food processor that I literally cannot live without as it makes my life so much easier!) I also went with Black Beans since I just really love them and we always have them them in the house for a variety of recipes. EASY! DELICIOUS! Ok, now on to the prep! I love to buy pre-sliced mushrooms, but if you have whole, then slice them in advance and saute them ahead as well. These too can be reheated when ready to assemble the tostadas. 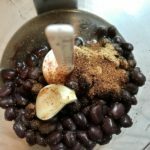 The beans can be entirely made ahead of time and stored in the fridge. Simply warm them up on the stove when ready to use. 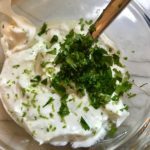 The Cilantro Lime Cream…yep, this too can be made ahead!! Shred the Manchego cheese using the large side of a shredder and place in storage bag. For the Cheese, I went with Manchego, which is a bit nuttier than a standard cheddar and has a deeper flavor that pairs so incredibly with mushrooms. Manchego generally comes in 3-month, 6-month, or 12-month aged varieties. I like the 6-month because it is firmer the more it ages, the flavor is more intense and the price is a bit easier on the wallet than the 12-month, but any of these will do! Slice the radishes and any other garnishes that you like to add ahead too. 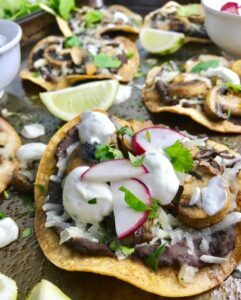 Wow, you have practically made this entire dish ahead, so on a sheet pan or in a large bowl, place the refried black beans, the mushrooms, the Cilantro Lime Cream, the radishes, the cilantro, extra Lime wedges, and the tortillas (wait to bake these on the night of the meal). Place the tortillas flat on a sheet pan. Spray both sides of each tortilla with Extra Virgin Olive Oil, then sprinkle salt and Chili Powder over top. Place the sheet pans in the oven on the center rack and cook for 10 minutes one side, then flip the tortillas over and cook for another 10-15 minutes on the other side until they are crisp all the way to the center. While the tortillas are in the oven, you can be reheating your beans and mushrooms. Now comes the assembly. 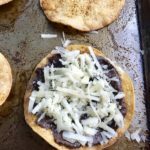 First, spread a layer of black beans on the tortillas and top with Manchego Cheese. Next top with mushrooms. Then add another sprinkle of cheese. Put the tostadas back in the 350 oven for 5-8 minutes or until the cheese is melted. Top with Cilantro Lime Cream, radishes, and fresh cilantro. Enjoy! 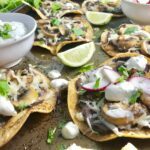 Mushroom and Black Bean Tostadas with Manchego Cheese and Cilantro Lime Cream are crazy good! 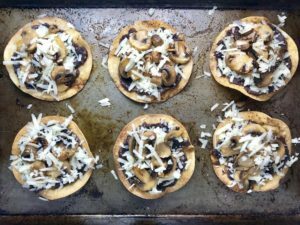 The tortillas are baked until crunchy, then topped with homemade refried black beans, nutty Manchego Cheese, sautéed mushrooms, and then baked until the cheese is melted. Top with cool cilantro lime cream, crisp radishes, and fresh cilantro. Simple, Gluten-Free, Vegetarian, Delicious! To a preheated hot medium-large skillet, spray a coating of Extra Virgin Olive Oil. Then add your sliced mushrooms, salt, and pepper. Spread out into an even layer as best as you can and then let them sit (don't stir) for 2-3 minutes or until the bottoms are seared and the natural sugars create this delicious brown edge. Then mix them up so that the other side is face down and gets a nice sear. They will reduce in size so that all mushrooms can now get some pan surface. 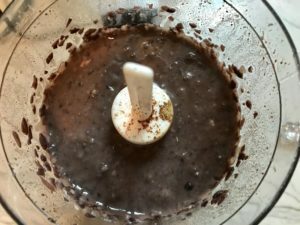 Drain and rinse the can of black beans. Add them to a food processor with with 1/4 cup water, 1 clove of garlic, and the cumin. Pulse to mince the garlic and blend up the beans. After blending, add the beans to the same skillet used for the mushrooms; there is no need to clean off, as its all great flavor in there! Just make sure the pan is hot again and add another light coating of Extra Virgin Olive Oil Spray. Stir the beans around as they cook so as not to burn. Turn the heat down to med-low and cook for 10 minutes so that the moisture cooks off and the beans get nice and thick. Zest the entire lime, then quarter it. Place 3 of the quarters in a storage bag. Finely chop 1 Tbls of cilantro for the cream and put off to the side. Then rough chop another 3-4 tbls of cilantro for garnish and place in storage bag. 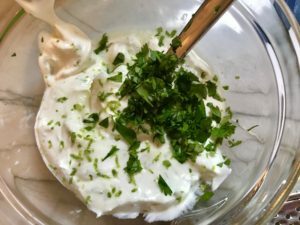 To a small mixing bowl, add the sour cream, the lime zest, the juice from one quarter of the lime, the 1 Tbls finely chopped cilantro, and the salt. Mix to combine, then cover and store in the fridge. Since Manchego generally doesn't come shredded, you can shred it ahead of time using the large side of the grater. Place the cheese in a storage bag for the fridge. Finally, wash and thinly slice the radishes. Place these in a storage bag. 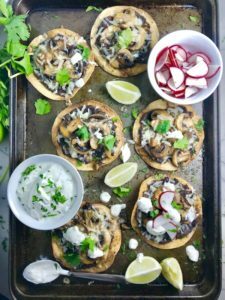 On a sheet pan or in a large bowl, place the refried black beans, the mushrooms, the Cilantro Lime Cream, the radishes, the cilantro, extra Lime wedges, and the tortillas (wait to bake these on the night of the meal). Place the tortillas flat on a sheet pan. Try to fit as many as you can without overlapping them. Its ok if they touch, but if they are laying on top of each other they will not get crisp in those places. You will likely need 2 pans to cook the tortillas or you can do them in batches. Spray the top of each tortilla with Extra Virgin Olive Oil, then sprinkle salt and Chili Powder over top. Then flip the tortillas over and do the same to the other side. Place the sheet pans in the oven on the center rack and cook for 10 minutes one side, then flip the tortillas over and cook for another 10-15 minutes on the other side until they are crisp all the way to the center. When the tortillas are done, you can place them on paper towel or pat them down to soak up excess oil. Now comes the assembly. 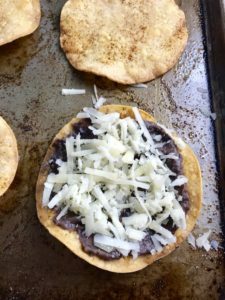 First, spread a layer of black beans on the tortillas and then top with shredded Manchego. Next top with mushrooms. Then add another sprinkle of cheese. Put the tostadas back in the 350 oven for 5-8 minutes or until the cheese is melted.